Buy / Stream: https://orcd.co/crookedstraightsinstrumentals If you’ve caught Blackalicious on tour over the last 19 years or so, you will have witnessed first hand the prodigious talent of Portland based rapper and singer Vursatyl. Blackalicious producer and owner of Quannum Projects Chief Xcel discovered Vursatyl’s crew ‘Livesavas’ back in the late 90’s and invited them to join him on the road to promote the Quannum Spectrum album (which featured Jurassic 5, El-P and Souls of Mischief among many others). Lifesavas went on to record two critically acclaimed albums for the label, and were named by Rolling Stone Magazine as one of their ‘Top Ten Artists To Watch’. 2015’s ‘Crooked Straights‘ marked a new chapter in the Vurstatyl story; unbelievably this was the first time he’d taken centre stage to release a solo record. 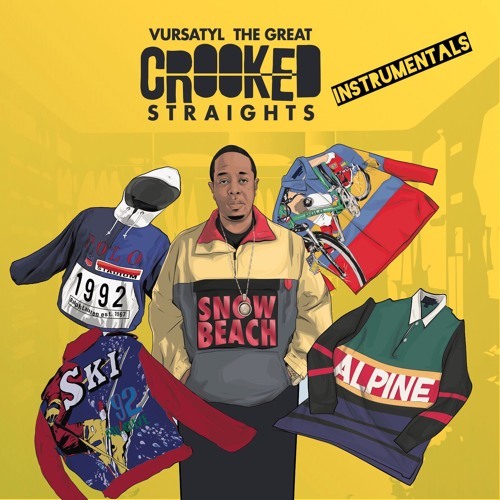 On top of Vursatyl’s masterful lyricism, ‘Crooked Straights’ is notable for its warm, soulful, Dilla-esque hip hop beats, created largely by local Portland producers. Those beats are finally unleashed here, with the release of ‘Crooked Straights Instrumentals’.